Speaking at a networking luncheon co-organised by the Hong Kong Trade Development Council (HKTDC), the Indonesian Chamber of Commerce and Industry, the Indonesian Chinese Entrepreneur Association and Real Estate Indonesia in Jakarta, Indonesia, today (March 2), the Secretary for Development, Mr Eric Ma, said that Hong Kong and Indonesia are long-time business partners. 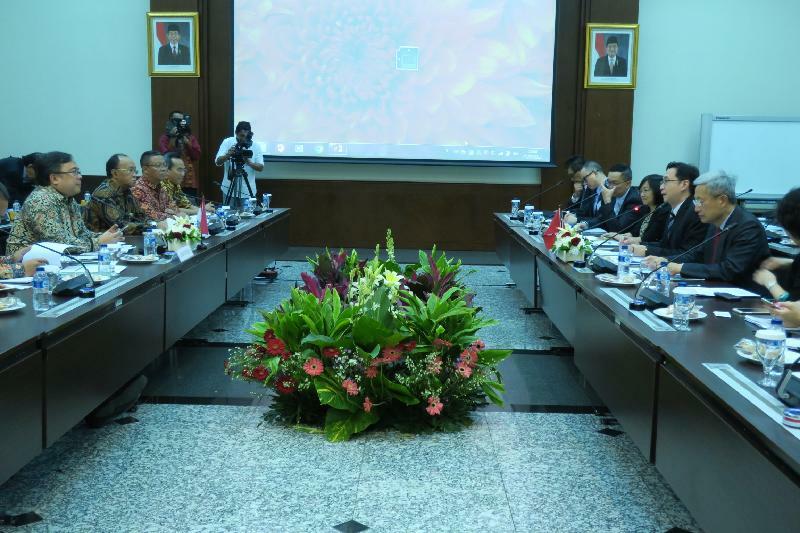 Last year, Hong Kong set up the Economic and Trade Office in Jakarta, signifying that the bilateral relations between Hong Kong and Indonesia have entered a new era. He said that Hong Kong construction companies have earned a reputation for speedy construction of quality high-rise apartment blocks and office towers. The adoption of specialised construction techniques, such as reclamation and design-and-build methods, has made Hong Kong a regional leader. Also, the industry is experienced in construction and management of cross-border infrastructure, including the Hong Kong-Zhuhai-Macao Bridge, the Guangzhou-Shenzhen-Hong Kong Express Rail Link, the Liantang/Heung Yuen Wai link and the three-runway system at the Hong Kong International Airport. The industry performed well last year, with the total value of various construction works at about US$30 billion. He said he believes Hong Kong's construction and professional services sectors can share more with their Indonesian counterparts in this regard. He said that in March 2015, China launched the Belt and Road Initiative, with policy co-ordination, facilities connectivity, unimpeded trade, financial integration and people-to-people bonds as the five major goals. For facilities connectivity, efforts will be made to give priority to removing barriers in the missing sections and bottleneck areas of core international transportation passages, advancing the construction of port infrastructure facilities, and clearing land-water intermodal transport passages. The connectivity of infrastructure facilities of the Belt and Road countries, including railways, highways, air routes, telecommunications, oil and natural gas pipelines and ports, will also be promoted. This will form part of a move to establish an infrastructure network connecting various Asian sub-regions with other parts of Asia, Europe and Africa. "Under the Belt and Road Initiative, Hong Kong performs as the 'super-connector' between Mainland China and other countries. 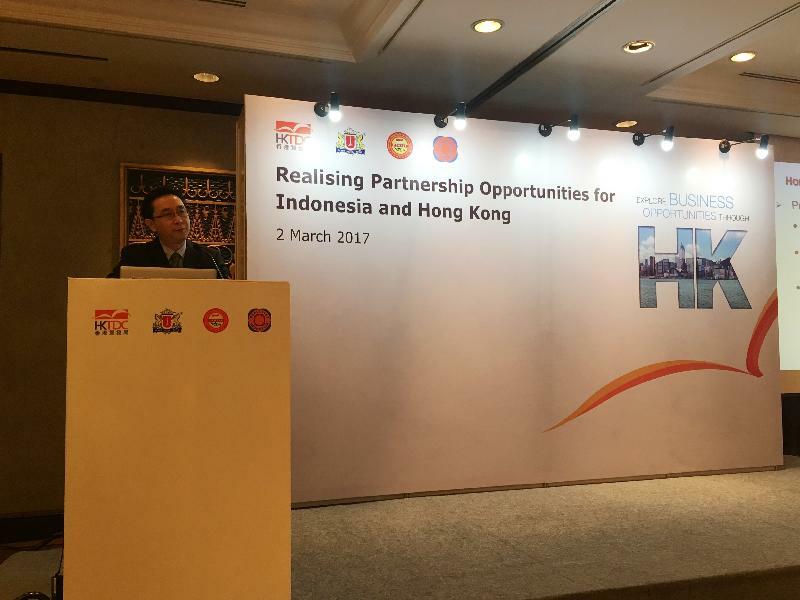 With our experience in infrastructure development and professional services, Hong Kong can certainly play an active role to further promote the relationship between Indonesia and China to reach new heights," Mr Ma said. Mr Ma is leading a Hong Kong delegation to visit Phnom Penh in Cambodia and Jakarta in Indonesia to promote the development of professional services and business co-operation between Hong Kong and the two places. The delegation left Cambodia and arrived in Jakarta yesterday (March 1) to continue their visit. 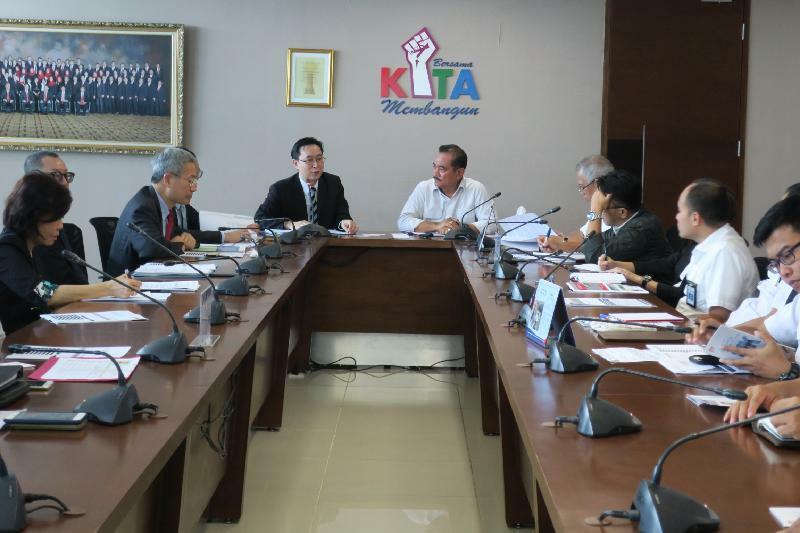 They paid courtesy calls on the Ministry of Public Works and Housing of Indonesia, the Indonesia-Hong Kong Business Association, the Ministry of National Development Planning of Indonesia and the Indonesia Investment Coordinating Board and exchanged views about town planning, infrastructure and real estate development. Members also held discussions with representatives from the local industrial and business sectors as well as Hong Kong business people to learn about the business environment and opportunities for co-operation. The delegation includes government officials, a representative from the HKTDC, members of the Working Group on Professional Services under the Economic Development Commission, and representatives from the construction-related, legal, accounting and company secretary sectors. Mr Ma will return to Hong Kong tomorrow evening (March 3).